Sprinter Marking manufactures inline and offline marking machinery. These coders make these types of marks: date and product coding, expiration date, sell-by and use-by dates, dot or spot marks, logos or symbols and pricing. Porous and nonporous surfaces can be marked. At Automated Marking Solutions, our team of experts is ready and willing to tackle any of your challenging assignments. We supply marking systems for a multitude of industries. All of our machines are manufactured to the highest quality, offered at a competitive price, and are guaranteed to last. If you have any questions feel free to give us a call and a representative will speak with you today! Product identification is the process of labeling or marking parts and components for the purposes of quality control and tracking. Identification marks in the form of numbers, logos, seals or designs, are embossed, etched, stamped or printed on many different surfaces by marking machinery, attributing the product to a manufacturer or producer. Product identification marks are becoming more important in the industrial world for a number of reasons. Firstly, the process of product identification allows businesses to reduce counterfeiting by checking the manufacturer’s codes and seals. Product identification marks are placed on a part by the manufacturer and can then be verified by the purchaser to ensure part authenticity. The process of traceability and the accountability of the manufacturer is becoming increasingly necessary for both local and export trading purposes. Today, most businesses in the automotive, medical and aerospace industries will refuse to consider purchasing inadequately marked products from suppliers as there is a lack of guarantee for the origin and quality of the part. Another important reason for the existence of product identification is that customer recognition grows due to the increased visibility of a company’s logo or design on its part components. This process is becoming more common and many everyday products, like promotional gifts, jewelry or engine parts, are now typically marked by marking machines. The permanency of the product identification mark tends to depend on the intended life span of the product and the context of its use, and this will be a factor in determining which process to use. 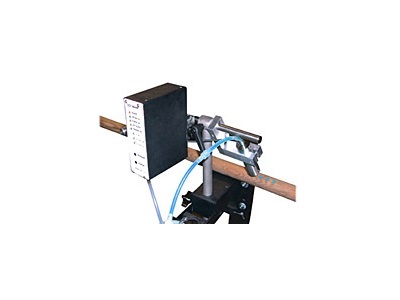 Marking machines employ many techniques, including: laser marking, press marking, roll marking, dot peen marking, stylus marking, and numbering using marking tools such as steel stamps and scribers. Laser markers use laser radiation with either a scribe or stencil system to create designs. Press marking uses a hydraulic ram to create an impression on a part. Roll marking can be used for either round or flat parts, and rollers or type holders press designs into the part or material. Rotary marking is used for circular parts, and marking is done on a rotating carrier. Stylus marking uses many sizes of marking heads to create an image, and nameplate marking uses an impression method to press lettering into a plate. Marking systems may be designed for manual use when the marking needs are low-volume and more simple. For high-volume product identification needs, marking systems or machines may be integrated into automated systems. Automation of the product identification process will also ensure consistency throughout the labeling of the parts. Product Identification - Elmark Packaging, Inc.